November 3, 2010 - Pilots for Continental Connection carrier CommutAir conducted an informational picket at Cleveland Hopkins International Airport to protest proposed pay cuts that would make them the lowest-paid pilots for their aircraft type in the airline industry. Coming at a time when experts agree the regional airline sector needs improvement, the pilots warned that CommutAir management?s plan to lower their wages is a direct assault on efforts to raise standards among regional carriers. ?No one wins in a race to the bottom,? said Colgan Air Capt. Mark Segaloff, who was recently elected to represent the CommutAir group as an executive vice-president of the Air Line Pilots Association, Int?l. (ALPA). 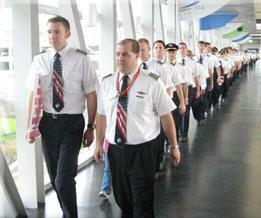 The CMT pilots joined the Association in 2008 and are negotiating their first union contract. ?Under CommutAir?s most recent contract offer, a new-hire pilot would make less than $20,000 a year,? Segaloff continued. ?Every airline pilot has a stake in what?s happening at this small airline, because if CommutAir is successful in cutting pay when the industry is coming out of its slump, they will lower the bar for regional pilots across the country.? The 134 pilots of CommutAir, based in North Olmsted, OH, began negotiations 20 months ago. In September the company unveiled its economic proposal: a 9 percent pay cut. ALPA?s economic proposal requests pay increases to bring the low-paying airline into parity with pilots flying similar turboprop aircraft. ?All the CommutAir pilots are asking for is an industry-standard wage. My airline, Mesaba, American Eagle, ExpressJet, and others have all weathered the same financial storms CommutAir has, and they set the market rate,? said Comair Capt. Mark Cirksena, who traveled from Cincinnati to support the CommutAir picketers. ?The pilots at CommutAir need a living wage with a reasonable quality of life.? Among the more than 77 pilots who participated in Tuesday?s picketing were ALPA members from 14 different carriers, including CommutAir, Continental, Delta, AirTran, ExpressJet, Colgan, Comair, Spirit, Mesaba, Air Wisconsin, Mesa, North American, Atlantic Southeast, and Trans States. Champlain Enterprises, Inc., operating name CommutAir, is a regional airline with its headquarters in South Burlington, Vermont and its operations center in North Olmsted, Ohio. It operates under the name Continental Connection for Continental Airlines, with its main bases at Cleveland Hopkins International Airport and Newark Liberty International Airport. It flies to destinations mainly in the Midwest and Northeast United States. CommutAir was established in 1989. It had a marketing affiliation with US Airways. Its headquarters were in Plattsburgh West, Town of Plattsburgh, New York. The airline changed affiliations to Continental Airlines in December 2000, when US Airways did not renew the codeshare agreement. In July 2001 the company announced plans to downsize its fleet and workforce by approximately half and begin a reorganization of the airline. In early 2002 the company began a "micro-hub" operation based in Albany, New York. At its high point in 2003 and 2004 the hub served the following cities: Allentown, Harrisburg, Buffalo, Rochester, Syracuse, Burlington, Manchester, Portland, Bangor, Providence, Islip, Hartford/Springfield, White Plains, Ottawa and Montreal, all with a fleet of Raytheon Beech 1900Ds. Service was also provided out Boston's Logan International Airport to Rutland, White Plains, Allentown, Burlington, Wilkes-Barre/Scranton, Islip, Saranac Lake, and Plattsburgh. Following unprofitable operations as Continental's regional affiliate in Albany and Boston, all operations were gradually shifted towards the midwest in 2005. In January 2003, CommutAir announced an agreement with Continental to feed the latter's Cleveland, Ohio hub. Service was commenced on March 16, 2003 with service to Kalamazoo, Michigan and Elmira, New York. Two cities were added the following month and by August 2003, CommutAir served 12 cities from the Cleveland hub. As of May 2007 the company has expressed plans to move operations from Plattsburgh to the Cleveland area. On May 20, 2008, Commutair's pilot group voted, 107 out of 118 eligible voters, for union representation by the Air Line Pilots Association. On June 5, 2008, Continental Airlines announced that it would cut flights and more than 3,000 jobs. A week later, it was announced that some of CommutAir's flights would be eliminated following Continental's announcement, beginning September 3.